-controversial Bill to silence the Media to get its 2nd & 3rd readings! ROAD TOWN, Tortola, VI - The Virgin Islands House of Assembly will be meeting at its Chambers in Road Town the Capital City on Thursday 13, March 2014 at 10:00 A.M. and a controversial piece of legislation aimed at media censorship is expected to come up for debate. It will be the Fifth Sitting of the Third Session of the Second House of Assembly, according to the Order Paper obtained by this news site. There will be no questions from the Virgin Islands Party (VIP) led Opposition for the ruling National Democratic Party (NDP) Government to answer after the Opposition boycotted the Budget Debate last month. The Opposition cited the bullying and disrespectful tactics used by the Dr. Smith Administration against its members. The culture of disrespect for members of the Opposition, lack of regard for laws of the Territory, protocols and traditions of Parliament and respect for the people, the reckless spending of taxpayers’ money, along with the rhetoric of misinformation have become one of the signatures of the NDP regime over the last two years. 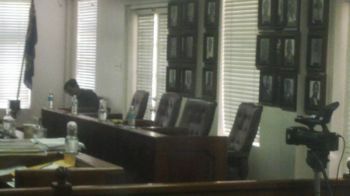 According to the Order Paper many Departments’ annual report will be laid on the table of the House of Assembly (HOA) to include the Deputy Governor’s Office, Social Development and the Human Resources Departments and the financial statements of the H. Lavity Stoutt Community College from 2004-2009. Many Bills before the HOA will get their first, second and third readings. They include the Human Rights Commission Bill 2014, the Criminal Code (Amendment) Bill 2013 and the Interpretation (Amendment) Bill 2013. However, the Bill that both the local and international community will be watching is the controversial Computer Misuse and Cybercrime Act 2013, a Bill designed to crackdown on press freedom and turn the Virgin Islands into a dictatorship. The NDP Bill targets mostly the online news sites and will impose heavy fines and prison terms for information obtained thought leaks to the online media via computer data. The Bill has been condemned by the Opposition, the local and international media along with many media and democratic organizations in the Caribbean and Europe. Many regional and International Organizations have called our newsroom to get information about the Bill and to ask us how they can help in protecting press freedom in the Virgin Islands. In response to the mounting criticism over this undemocratic piece of legislation the NDP Government has claimed it is just an effort to protect the Financial Services Sector, however the Bill has no bearing on international media houses as they will be out of the reach of the local government laws. Therefore, the only persons that will be affected by this backwards Bill are the local media houses which have been the target of the NDP from time they took office. It was some six months after they took office that the controversial Minister for Education and Culture Honourable Myron V. Walwyn called for media censorship and he has been consistent in the HOA with that call. Hon. Walwyn, a first-term At-Large Representative, has emerged as one of the most divisive politicians in recent VI history and has on two occasions used his HOA privilege not to fight for the people of the Territory or for education and youths, but to attack the staff of an online news site. One local talk show host Edmund Maduro on his EGM radio show aired Thursdays from 8:00 P.M. on ZROD 103.7 FM vowed to rather go to Balsam Ghut jail than to be muzzled. He said the Bill is only an attempt to hide government corruption and intimidate the press from reporting on this. The HOA meeting will be carried live on CBN Channel 51 on March 13, 2014 from 10:00 A.M.
excuse me but who is this person stealing everyone's identification? how ignorant you are of the ramifications and world history. You, too, will be affected if there isn't freedom of speech and investigative reporting to keep people honest. Look here for me. At a time when the BVI is saddled with a myriad of problems including poor infrastructure, poverty, mediocre and a weak educational system, rising crime, non-diversified economic base, an unraveling social fabric, high government dependency and political victimization with a bloated civil service with ballooning cost, an unfunded retirement plan liability (around $400M), environmental compliance issues, a struggling/underperforming health care system, a corrupt government, NDP spending like a drunken sailor, and discrimination against locals instead of the NDP addressing this they bring a bill to censor the media. What a ting to tell the king!!!! Oh yea censorship is the only hope of reelection!!!!!! If the new Act stops the appalling level of pontificating journalism (and I use that word in its loosest sense) then it cannot come too soon. What happen to the Bomma he gone quiet the ball head stallion give him a dose of hush wow,come on Bomma no one can't silent you Bennie taught you better lets go start punching back they got you knock down. The NDP has proven (with the hospital) that they are incapable of completing major infrastructural projects on time and within a reasonable budget. But even the unreasonably expensive and unsustainable projects they plan to forge ahead with, this bill will ultimately be their undoing when push comes to shove. Let them proceed. If the bill goes ahead, I have no doubt it will be rewritten or abolished altogether within a very short period of time. The voters will have their say soon enough. 2015 is just around the corner. Fool me once, shame on you. Fool me twice, shame on me. Government in the sunshine indeed! Does anyone wonder why they dropped that slogan in their last campaign? From your previous posts I consider you an intelligent person. This bill is about stopping leaks of confidential information. How is that considered media censorship in the general sense? Also, the VIP had no part of the hospital mess? Why do the NDP want to hide there spending money. I want to know where my tax paid money going to. We the people need to know where our money is going. So when we vote, we vote for the people who going help the people and not help there self. I vote to watch these NDP and VIP and every money that cant be accounted for lock them up. Foolishness!!!! What ever happened to our "GOVERNMENT IN THE SUNSHINE?" if our people were serious they will show up at the house of assembly and join the fight for the press BUT will that never happen in modern-day-BVI.......these islands have so many issues and ALL NDP can come up with is fighting the press.....what about those old men that trouble our girl children(where are the laws).....big men and women making 4.00 per hour and NDP doing NOTHING for our black people....what is next with this NDP,what size house we can build, how many cars we can own.....any person voting for the smith crew come 2015 will be sick in the head !!!!!! next year money will be spent just before election....run go talk that !!!! !